Here’s a little secret: if you don’t make your credit card payment on time, the fee you’ll pay doesn’t go toward saving whales or rainforests. Mostly, it just goes straight into your card issuer’s pocket. And since money is kind of a big thing for credit card companies, they’re more than happy to let that due date slip your mind. Let’s get this straight. 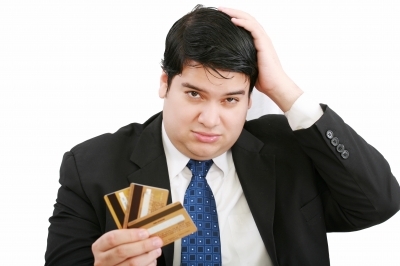 Credit companies can’t outright encourage you to misuse your card. That would be morally reprehensible and, more importantly, completely illegal. However, while they’re not allowed to put up “free candy” signs to sway unwitting consumers off of the straight-and-narrow path, they aren’t required to warn you about debt, either. And as long as they continue to make money from your screw-ups, you can be sure that the path to good credit will remain unmarked, full of pitfalls and wired with snares. For example, here are some financial holes that your card company would just hate to see you fall into. 1) Paying the minimum. Sticking to the “minimum mandatory payment” is one of the most common and devastating mistakes consumers make with their credit cards. Though these low payments – often around 2% of your monthly balance – seem like a helpful tool to use credit responsibly, all they really do is compound your debt problem every month until it swallows you. Minimum payments are set low because they’re designed to extend the life of your balance indefinitely, thereby earning your card issuer thousands and thousands of dollars in interest. In fact, if you were to make the minimum payment on a card with a $1,000 balance and 16% APR, it would take you 7 years to pay off your balance, and it would cost you $566 in interest. Of course, that’s assuming you don’t make any additional purchases while you’re paying it off. 2) Adding charges to a transferred balance. Transferring your balance to a 0% APR credit card certainly seems be a good way to dodge interest for a year or two. In fact, a balance transfer has saved the day for many indebted consumers over the years. But this little switch is a double-edged sword. If you get careless and spend even a little bit with your new piece of plastic, it’ll come back to haunt you. See, a transferred balance actually creates two balances on your new card. There’s the old 0% APR balance, and there’s the interest-accruing balance. That’s the balance that grows every time you make a new purchase. Under new regulations, card companies are allowed to force you to pay off your oldest balance first, meaning that every new charge you put on the card will rack up interest until you pay down your old debt. Therefore, if you’re contemplating a balance transfer, it’s important that you never, ever, use that new card to buy anything. Freeze it, stick it in peanut butter or set it on fire as a sacrifice to the gods of finance – anything to remove the temptation to spend. On some credit cards, the interest rates for cash advances can be close to 30%. On top of that, you’ll have to pay the ATM’s bank a fee for using a non-sponsored card in their machine. Another fee equivalent to 2-4% of your withdrawal goes to your credit card company for not knowing better. All this can add up to a very hefty charge on your balance. So for your own sake, use credit and debit cards appropriately. 4) Getting a prepaid debit card. Prepaid debit cards are the hottest plastic rectangles on the market right now. That said, they’re also a totally dangerous and irresponsible product, and they’re being marketed to the demographic that is most likely to abuse them. Prepaid debit cards are aimed at people who have bad credit or no credit, and the idea is that these cards can help them rebuild. But the cards don’t actually report your transactions to the credit monitoring bureaus, and therefore they can’t help you build your credit rating at all. So what do they do? They charge you fees. A lot of fees. There are fees for keeping your account open, fees for not depositing enough every month, fees for depositing too much every month and fees for just about everything else. The Consumer Financial Protection Bureau announced recently that it’s in the process of drafting legislation to keep these nasty little cards in check, but these protections could be years away. Bottom line? Do everything you can to avoid the siren song of prepaid debit. There are plenty of ways to use credit responsibly, but making any of these four mistakes will only bring you sorrow, and possibly even debt. Since your credit card company won’t change until the government forces it to, it’s up to you to recognize and avoid these common credit card mistakes. Luckily, they aren’t hard to spot. Plus, when you use your card responsibly, you’ll have the satisfaction of knowing that somewhere on Wall Street a credit executive is looking at your pristine record and sighing dejectedly. And that’s worth its weight in gold.